Andy Caldwell and Bass Kleph come up with a new electro house track with all the noticeable trademarks of two exciting artists in today’s electronic dance music scene. 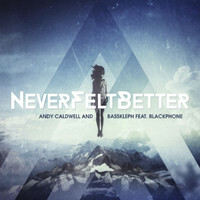 ‘Never Felt Better’ takes you on a musical journey of guitar riffs, drum beats, bass and synths, all brought to life with the vocals of Blackphone. The end result is a big track that should do well on it’s release. Remixes come from Finland’s Tom Fall, who increases the BPM and brings wave after wave of electro ripsaws; Canadian remixer, Togglehead, who adds a big room, floor filling vibe to the track; and Andy Caldwell himself, who goes deep with a remix that gives a decent reminder of why house music remains so popular. Check it out below.